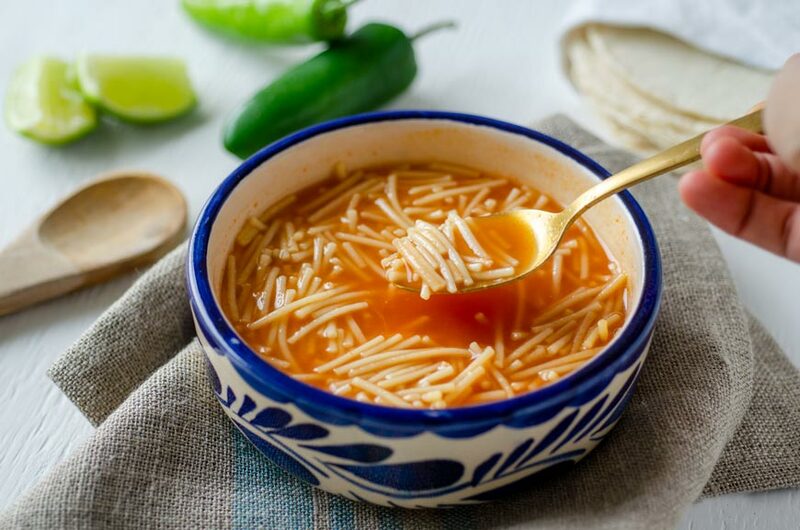 Fideo soup is what Mexican childhood memories are made of. It is a warm comforting soup made with a tangy tomato base and golden brown noodles. It is so popular with moms because it is very easy to make, and kids love it because what kid doesn’t like noodles? So what makes a sopa de fideo authentic?? 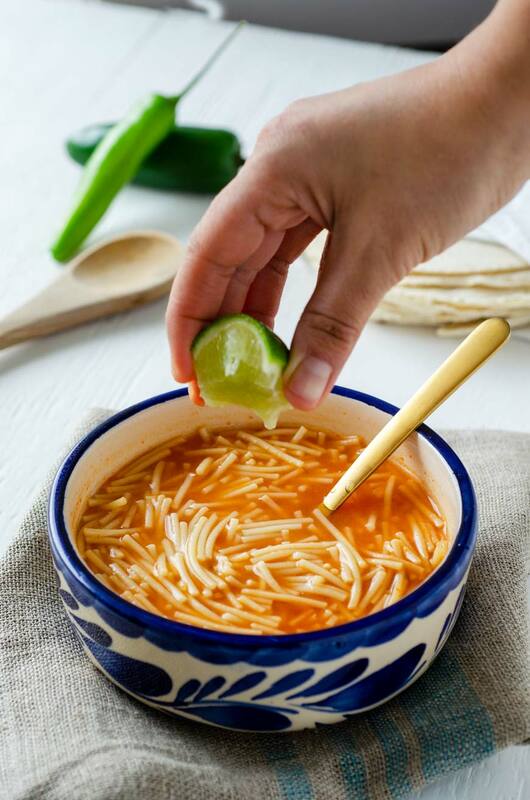 I think the only true answer to this would be, that the most authentic sopa de fideo is the one your mamá used to make. So go ahead and ask her for the recipe!! Though I find that every cook adds their own touch to it, some may add cilantro, chipotle or jalapeños. 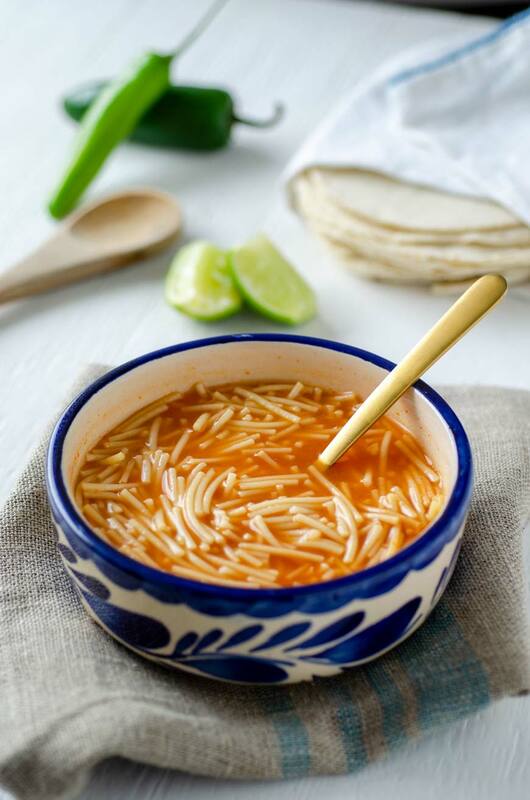 There are also several variations of sopa de fideo that are well-known like sopa de fideo con frijoles, sopa de fideo with albondigas, and sopa seca de fideo. Regardless of how your mom makes it or the different variations, the base of this soup consists of blending tomatoes, onion, garlic, and broth and pouring that over very thin noodles that have been sauteed until golden brown. More vegetable broth is added then everything is simmered until tender. I like to add zucchini to mine for nutritional purposes, but my mom never added zucchini to hers. My mom usually made hers a sopa de letras, using alphabet pasta instead of angel hair to make it fun for us. To make this vegan, I simply used vegetable stock instead of chicken stock. For this version, I used canned tomatoes because tomatoes are not in season right now. If it’s summer I recommend you use fresh tomatoes. 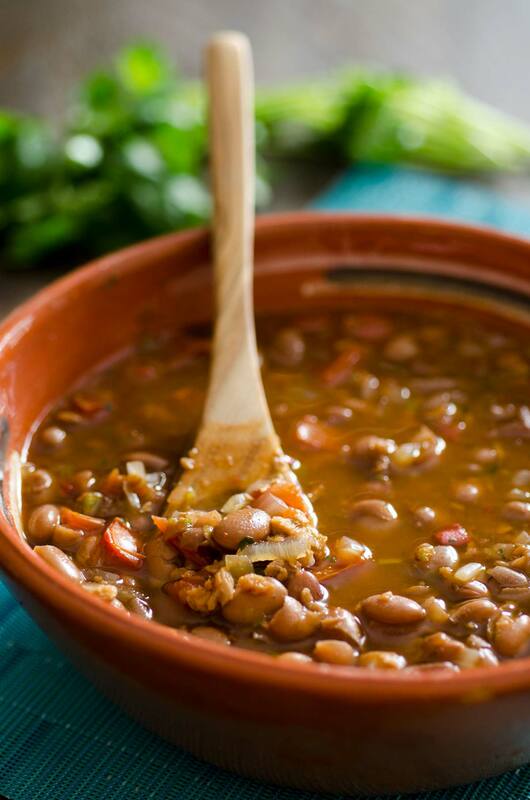 You can add zucchini, carrots, beans or potatoes to this for higher nutritional value. You can also make this soup using alphabet pasta to make sopa de letras. To make this recipe without oil set the pot to medium-low heat and add the noodles. Dry toast the noodles until golden brown stirring constantly, about 3 minutes. Continue with the rest of the recipe as written. I like to add a sprig of cilantro with the zucchini, but that is completely optional. 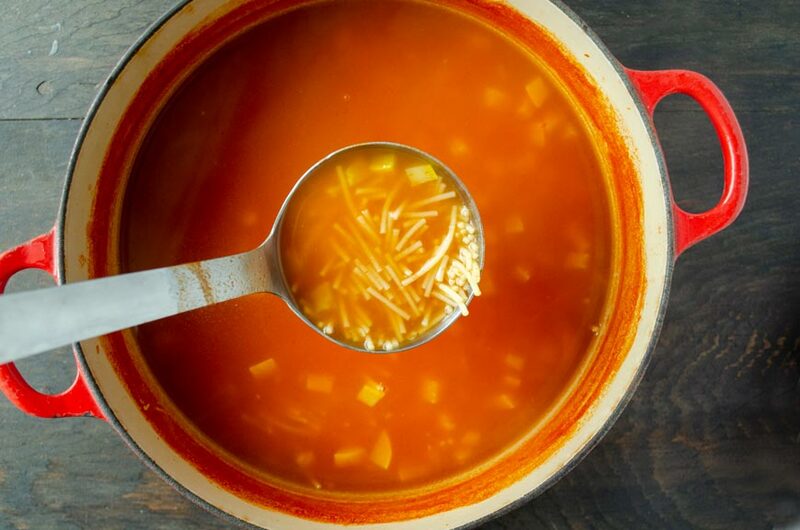 How to Make Sopa de Fideo? It is a warm comforting soup made with a tangy tomato base and golden brown noodles. Kids love it!! In a medium pot get your vegetable stock boiling hot and set aside. Set a large pot to medium heat and add oil. Once the oil is hot add broken up noodles and toss to coat in oil. Continue to cook until noodles are golden brown, about 3 minutes. While the noodles are browning, place the tomatoes, onion, garlic, and 2 cups of the vegetable stock in the blender and process until smooth. 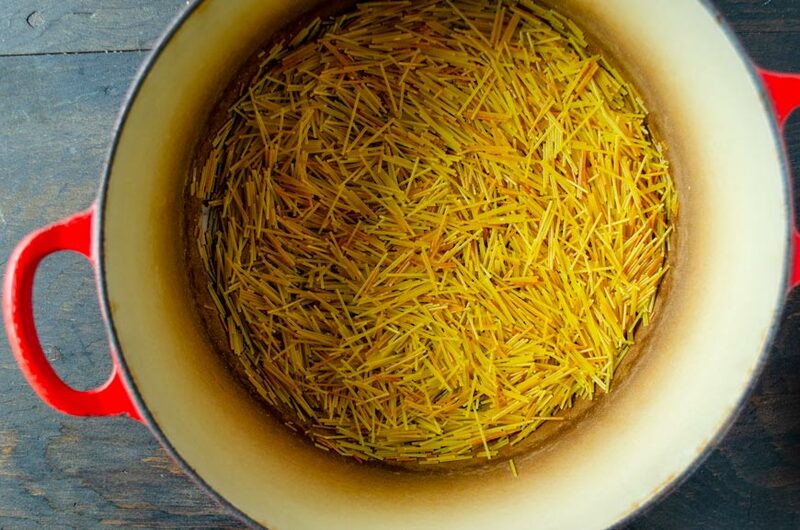 Strain this mixture directly into the golden noodles still in the hot pot. Stir to prevent the noodles from sticking. Let mixture simmer for 1 minute. Add the rest of your stock and set heat to high. Add zucchini and cook noodles at a low boil until noodles are al dente and zucchini is tender. Stir often. Season. Serve with a wedge of lime so everyone can add as much lime juice as they like. For this version, I used canned tomatoes because tomatoes are not in season right now. 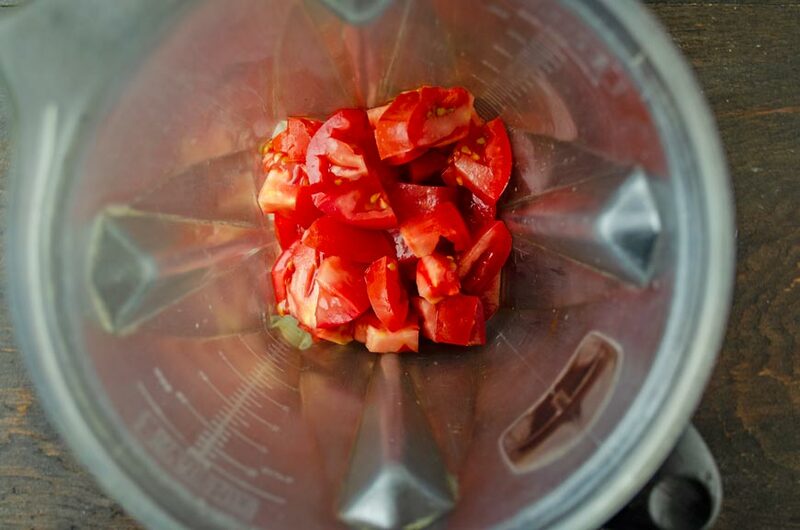 If it's summer I recommend you use fresh tomatoes. Are you looking for more Mexican soup recipes?? 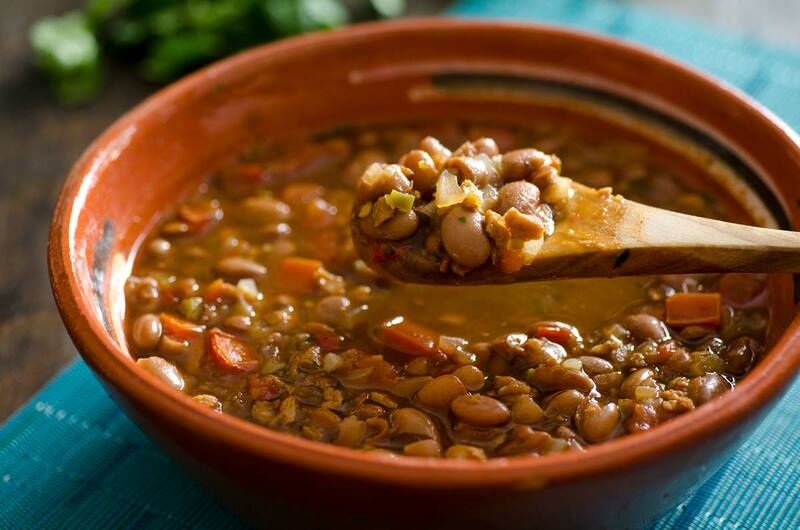 Try this pozole verde, pozole rojo, vegan tortilla soup, vegan caldo de res, and this vegan albóndiga soup. 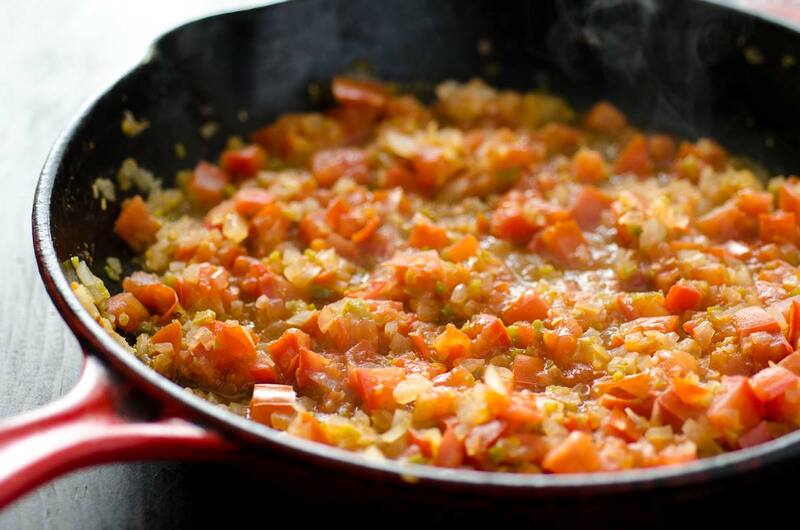 02/25/2019 /2 Comments/by Dora S.
This salsa molcajeteada combines pan roasted tomatoes, garlic, and peppers to make a spicy and hearty salsa. They are ground down in an authentic Mexican molcajete. 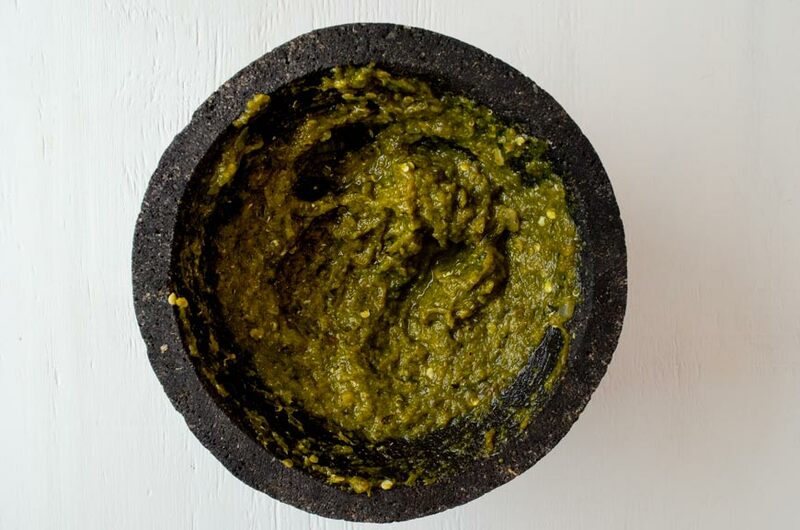 It is a staple in all Mexican homes, super easy to make, even if you don’t have a molcajete, and it adds a perfect touch of spiciness to any meal. 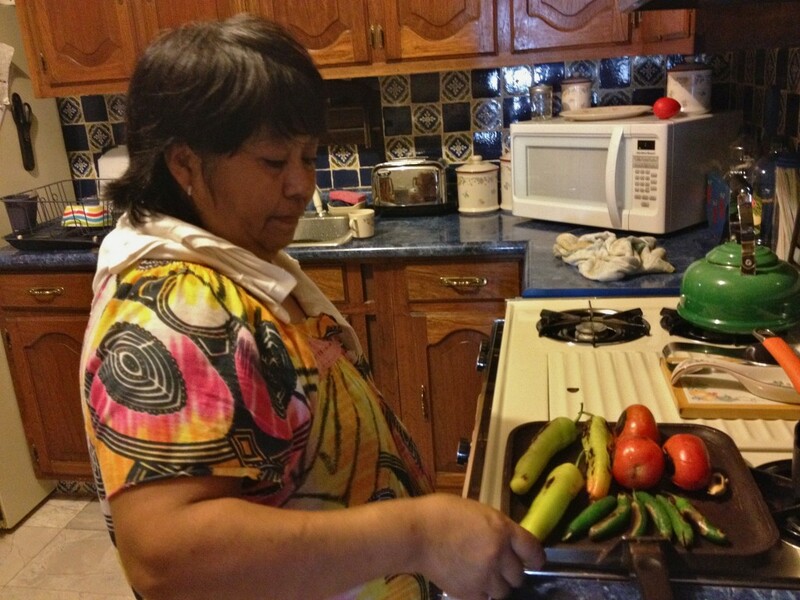 This recipe is from our housekeeper Polita, or I should say my parents’ housekeeper. I wish I had a housekeeper!!! She has worked with us for over 20 yrs. She was my nanny, as well as the house cook, and seamstress. Over the years she has become more of a companion for my mother and a beloved part of our family. than a couple of years ago. Be careful of cheap molcajetes because they might be made with cement and not volcanic stone. 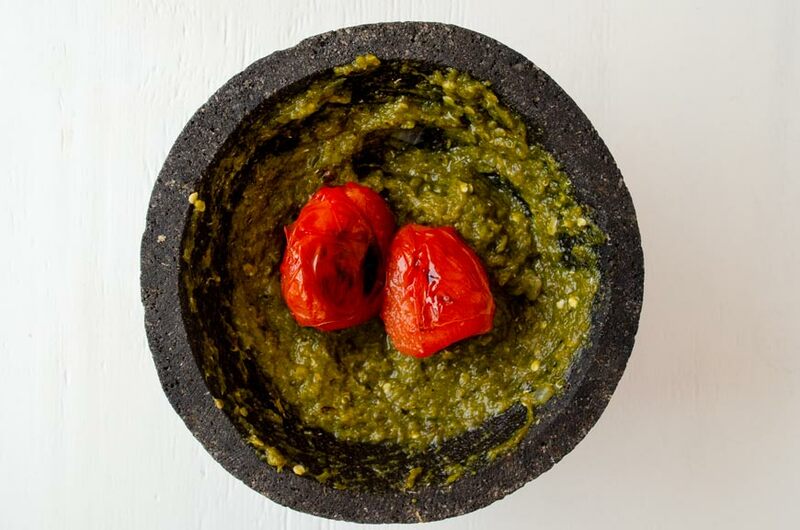 There are ways to tell if your molcajete is made with cement or volcanic rock. Usually a molcajete made with cement will not release any grit or if it does it will be a fine powder. 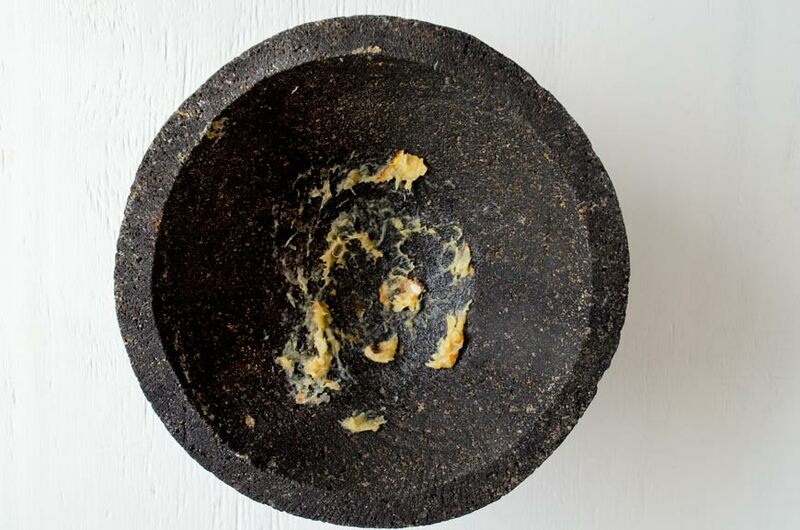 A real volcanic rock molcajete will release grit into your food until it is properly seasoned. Once you determine that your molcajete is real, you will have to season it, unless you bought it already seasoned. To season it you basically have to grind a mixture of rice and a little bit of water, over and over again until the paste comes out white. You can see step-by-step instructions here. Now you’re all set! 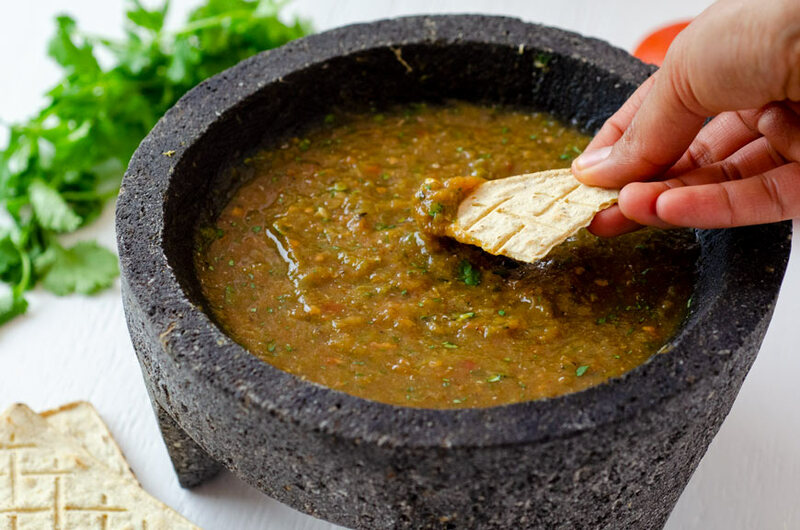 When I use the molcajete to make salsa I feel so connected to my roots and my people. 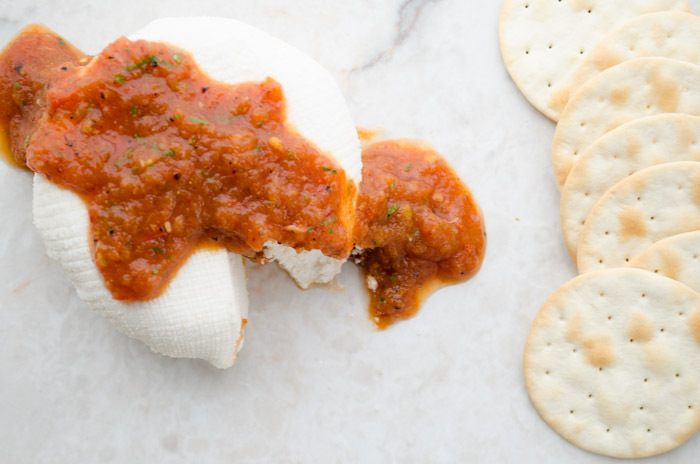 I don’t know if it’s the repetitive motion that gets you thinking, but just to think that hundreds of years have passed, and I can still make salsa the way my great-great grandma did is something truly special. Warning!! This salsa is hot. If you would like a medium heat to your salsa omit the serrano peppers. If you can find them use chilaca peppers instead of anaheim. 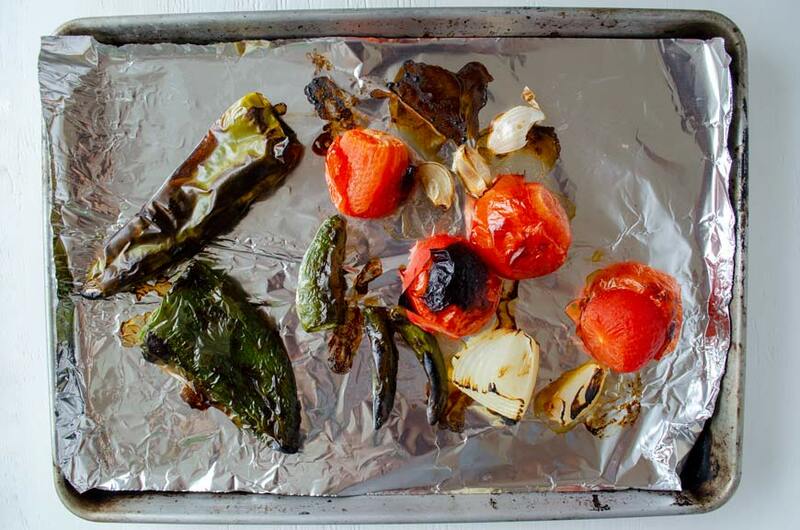 To make this recipe even quicker you can place your peppers, tomatoes, garlic, and onion under your oven broiler set to HIGH until they are charred. Be sure to flip them halfway through so they char evenly. If you do not have a molcajete you can use a blender or food processor. Simply place all the cooked ingredients in the machine and pulse until the desired consistency is reached. I prefer it on the chunky side. 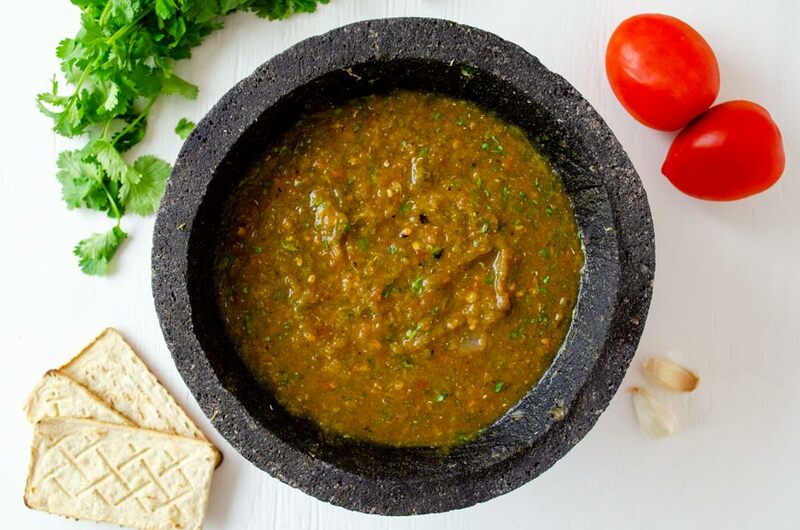 This salsa molcajeteada combines pan roasted tomatoes, garlic, and peppers to make a spicy and hearty salsa. Made in an authentic molcajete. Cut off the stems of the peppers and the tops of the tomatoes. Remove ingredients from griddle and set aside. Peel most of the dark burnt skin off of the tomatoes and chiles. You can leave a little bit for the smoky flavor. Peel the garlic. To start grinding ingredients in molcajete, place 1/2 tsp. of salt and the garlic in the molcajete. Grind down until a thick paste has been made. Add the pepper and grind down one by one until you have the desired consistency. Add the tomatoes one by one and keep grinding. Chop the onion and add it to the molcajete with the cilantro. Season to taste and serve. 01/15/2019 /1 Comment/by Dora S.
Did you know you could make a Mexican style crema with almonds?? 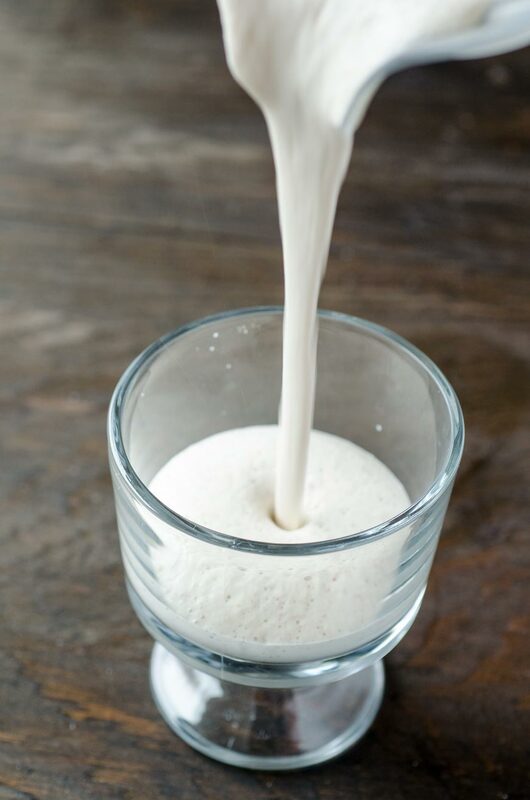 That’s right, a delicious and smooth crema made without dairy! Most recipes call for cashews, but cashews are pretty expensive, so I stared using almonds instead and loved the result. In fact, I think almonds work better since they are not as sweet as cashews. This almond crema can be drizzled on your enchiladas, tacos, sopes, or pretty much any vegan Mexican dish. 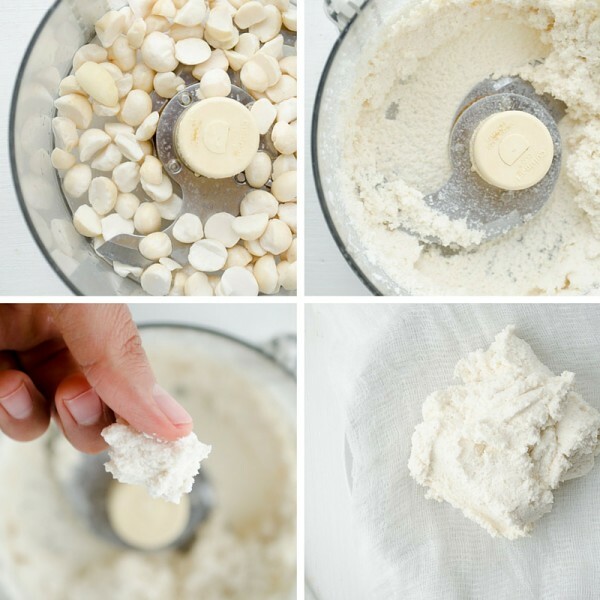 The best part of this crema is that it is very versatile. You can add chipotle to it and drizzle it on pasta, or you could add roasted poblano to it and make poblano cream enchiladas. You could even omit the garlic, and add a banana to make an almond banana yogurt. , which was a wedding gift, that I love and use almost everyday.) If you do have a high powered blender, you can be lazy like me and make this crema without peeling or soaking the almonds. If you don’t have a high powered blender you will have to soak the nuts the night before, peel them, then blend them. 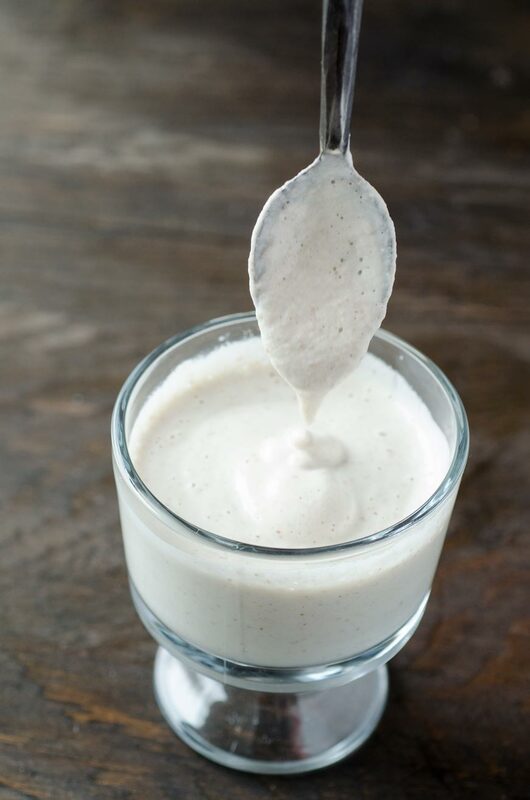 Mexican crema is much thiner than than sour cream, so if you’re looking for a sour cream recipe simply reduce the amount of liquid in this recipe. The possibilities are endless with this almond crema! Add nuts as is, just make sure to blend until the sauce is very smooth. Soak raw almonds for at least 8 hrs. Did you know you could make a Mexican style crema with almonds?? That's right, this delicious and smooth almond crema has no dairy! 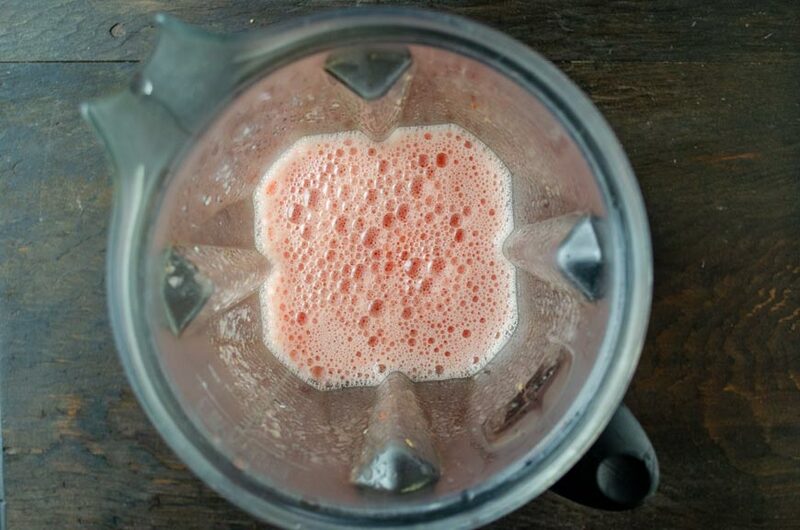 Place the almonds, garlic, water,almond milk, and lemon juice in the blender and process until smooth. Season with salt and pepper. Boil water in a small pot and pour over almonds. Let sit overnight at room temperature. The following day peel the almonds. The skins should pop right off. 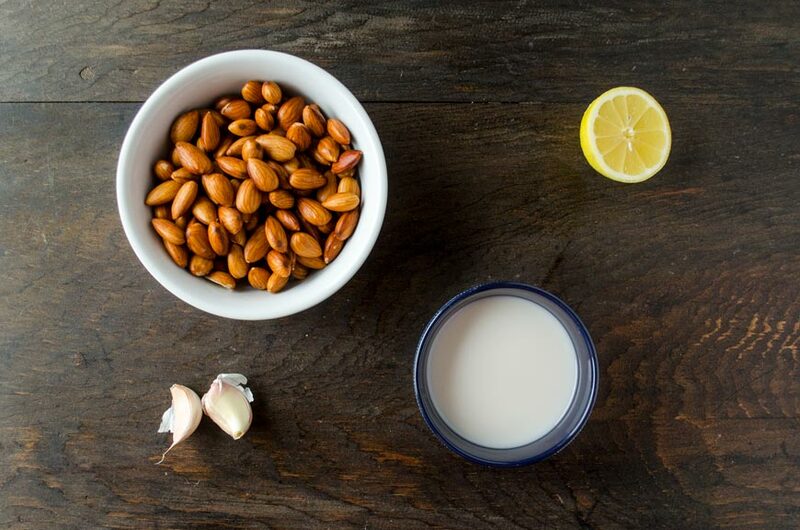 Place the almonds, garlic, almond milk, and lemon juice in the blender. 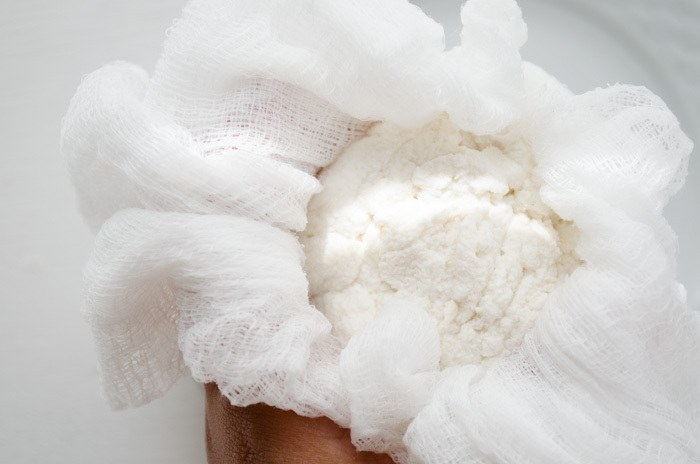 Add ¼ cup of water and process until smooth. If it is too thick, add the remaining ¼ cup of water. 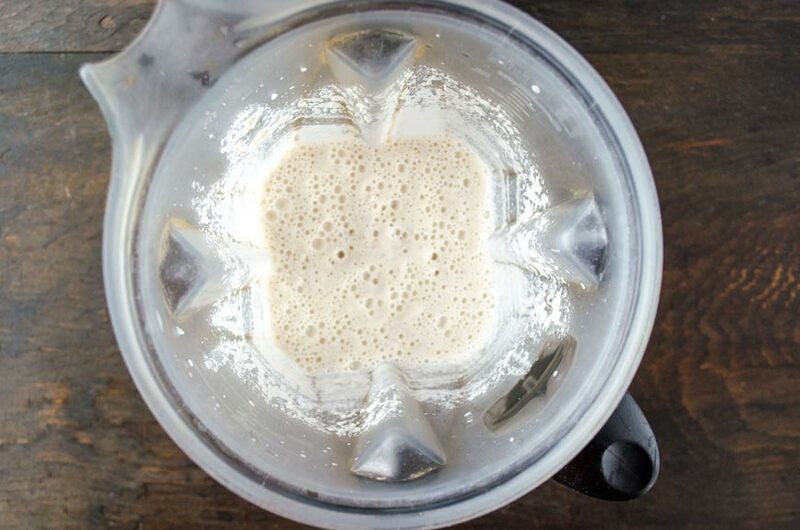 If you don't mind using oil, use it in place of the almond milk for a smoother sauce. 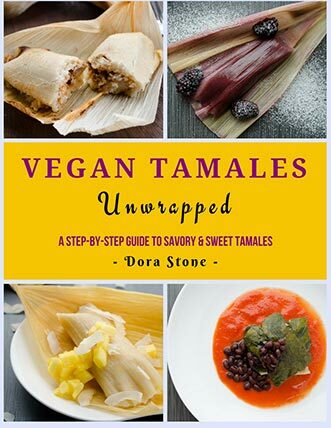 04/15/2018 /0 Comments/by Dora S.
and I was thrilled to receive a copy, and to share with you this recipe for Mashed Potato and Poblano Flautas. Eddie is the Senior Manager of food & nutrition at the Humane Society of the United States. 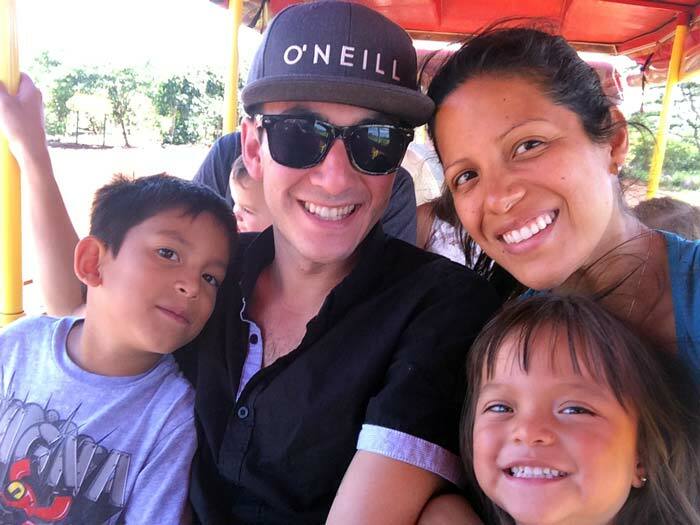 He is very passionate about teaching the Hispanic and Latino community about healthy plant-based eating. He often appears on TV giving demonstrations, and he travels around the US and Mexico giving cooking classes. I had the opportunity to speak to him over the phone and I was touched by his energy and dedication. ¡Salud! 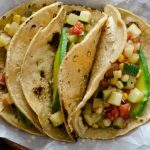 Vegan Mexican takes traditional Mexican dishes and recreates them to be healthy and plant-based. You can find everything from tacos, burritos, enchiladas, tamales, and salsas. The recipes are very easy to follow and will appeal to the whole family. My favorite part of the book is that it has both very traditional recipes and some not so traditional ones taken straight out of Eddie’s childhood. (Eddie’s family is from Mexico, but he was born and raised in Brownsville, TX.) My only complaint is that I wish the book had more pictures. , itunes, and Barnes & Noble. 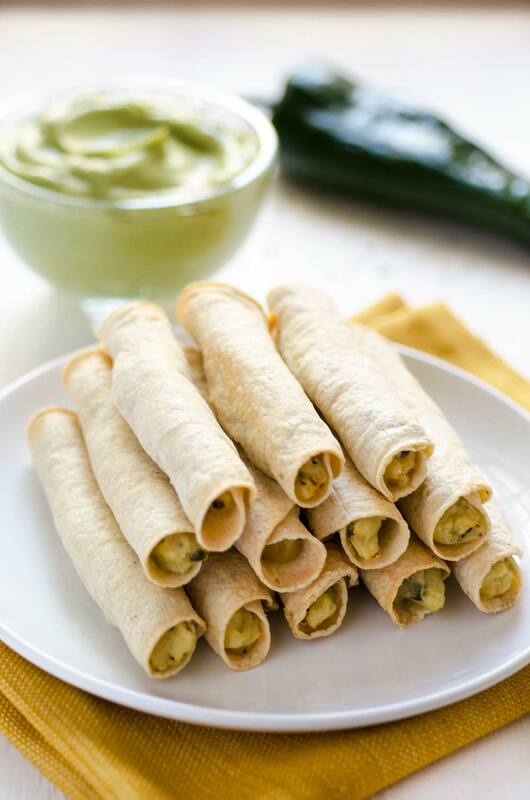 These crispy golden flautas are filled with mashed potatoes spiced with poblano peppers, garlic, onion, and cumin. They can be baked or pan fried to a crisp. Your kids will love them! Serve with your salsa of choice, or you can serve them with this Spicy Avocado Sauce for Tacos. Preheat the oven to 425°F. Lightly spray a nonstick baking sheet with a nonstick cooking spray. Heat the oil in a large skillet over medium-high heat. Sauté the onion and poblano chile for 4 to 5 minutes, or until the onion is translucent. Add the cumin seeds, salt, pepper, and garlic. Sauté 4 more minutes. Remove from the heat. In a large bowl, mix together the onion mixture, cooked potato, and almond milk. Mash well. Some visible chunks are fine. Warm the tortillas until they are pliable. To assemble the flautas, place 2 tbsp. 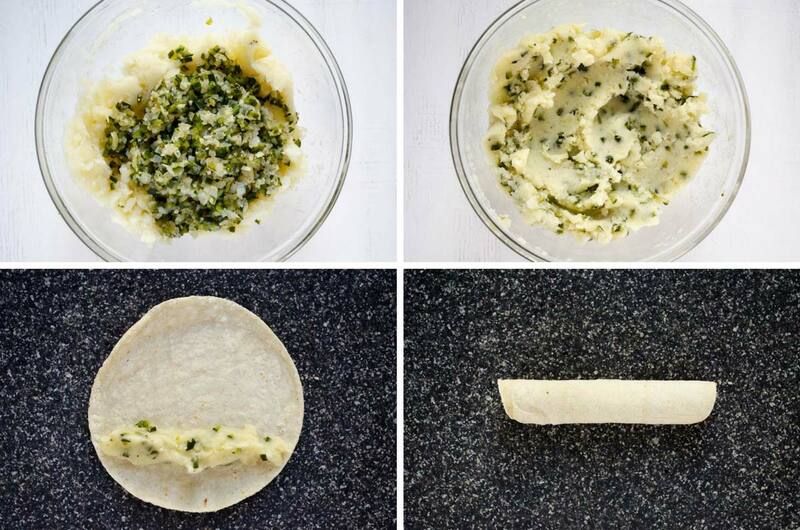 of potato filling in each tortilla and roll it up tightly. Place on the prepared baking sheet. Repeat until all the tortillas are rolled up. Lightly spray the flautas with nonstick cooking spray and place in the oven. Bake 10 to 12 minutes , or until the edges of the tortillas are brown and crispy. Turn the pan halfway through the cooking time for even cooking. I received a free copy of this book, but all opinions and thoughts are my own. 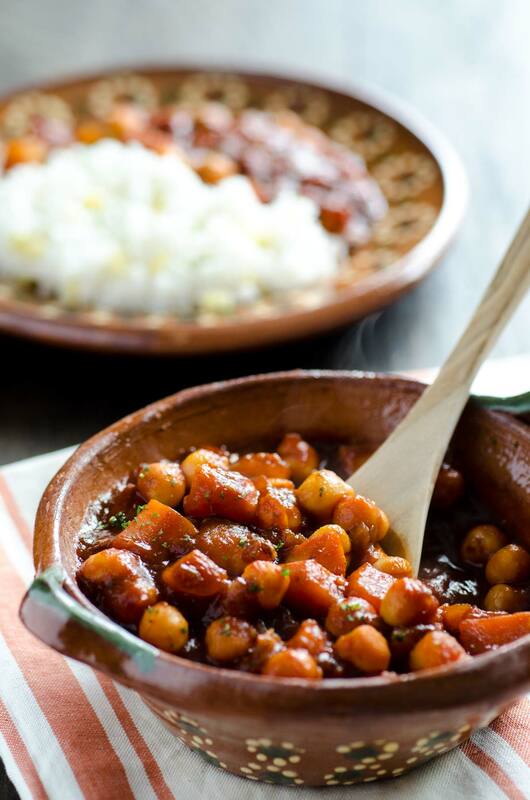 02/02/2017 /3 Comments/by Dora S.
This sweet potato and chickpea stew combines sweet potatoes, yukon gold potatoes and chickpeas in a classic chile colorado sauce. The combination of chile ancho, chile guajillo, oregano, a pinch of cumin, and garlic add a smoky and savory flavor to the stew. 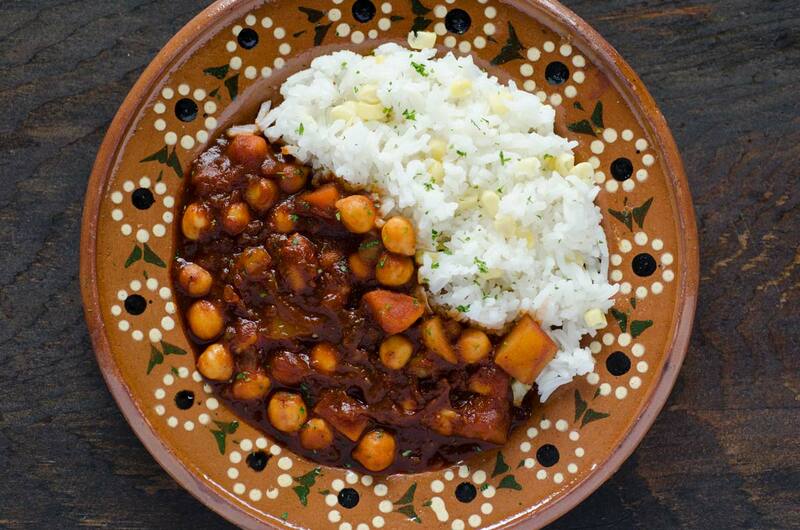 This dish is inspired by a very northern dish called guisado de puerco in chile colorado. I have of course left out the pork and used a combination of potatoes and chickpeas. 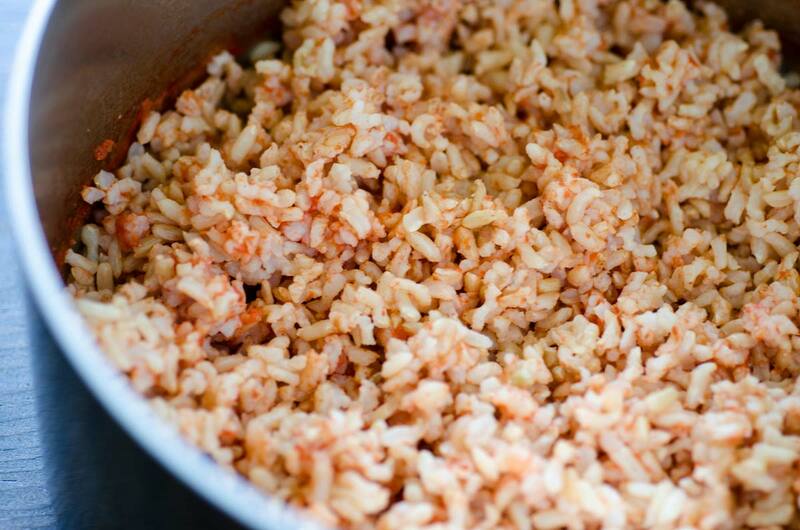 It is best served with rice, beans, and warm tortillas. I know working with dried chiles can be intimidating at first, but it is quite easy. All you have to do is remove the stems and take out the seeds. 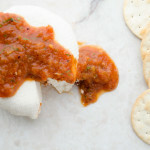 They can be slightly toasted to bring out the smoky flavor of the chiles, but it is not necessary to do so. To use them you have to first reconstitute them in hot water. Simple drop the deseeded chiles in nearly boiling water and let them sit for about 10 minutes or until they are soft and pliable. They can be found in your local hispanic market or now most grocery stores carry them in their hispanic sections. 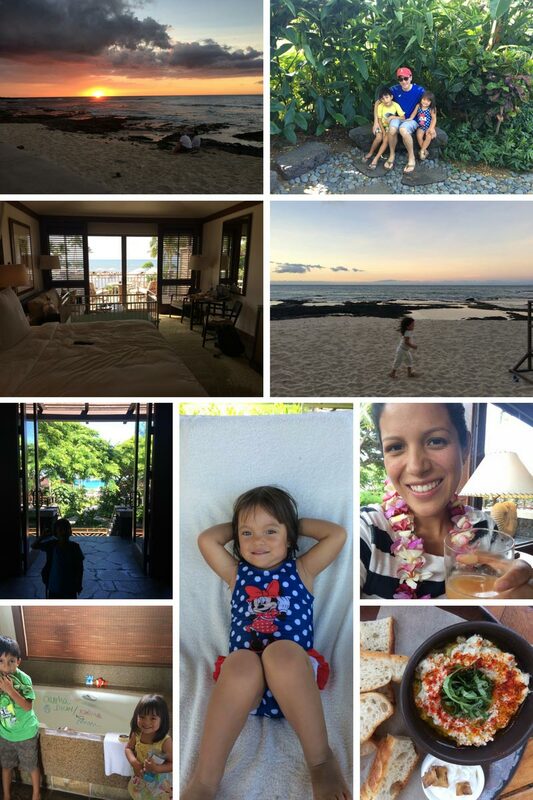 We have been in Hawaii 7 months now!! Can you believe it? I can’t. 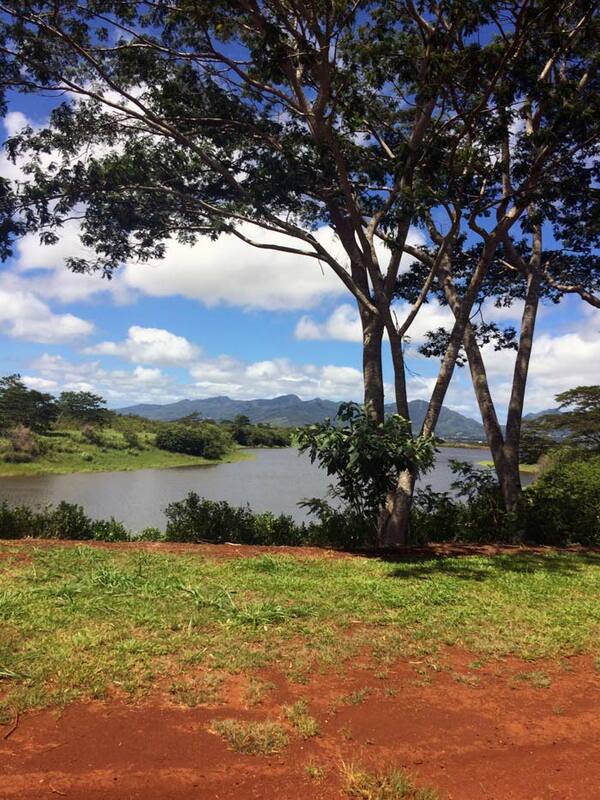 I think it has taken me this long to really appreciate the beauty of Hawaii, its people, and culture. 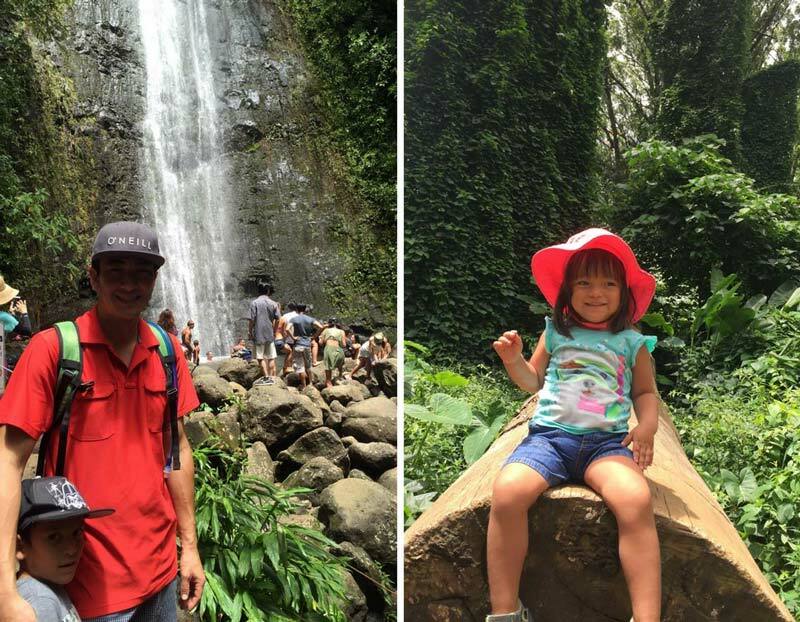 We recently travelled to the Big Island for a small 3 day vacation.The Big Island is so different from Oahu, less crowded, but there are not as many restaurants and shops as Oahu. 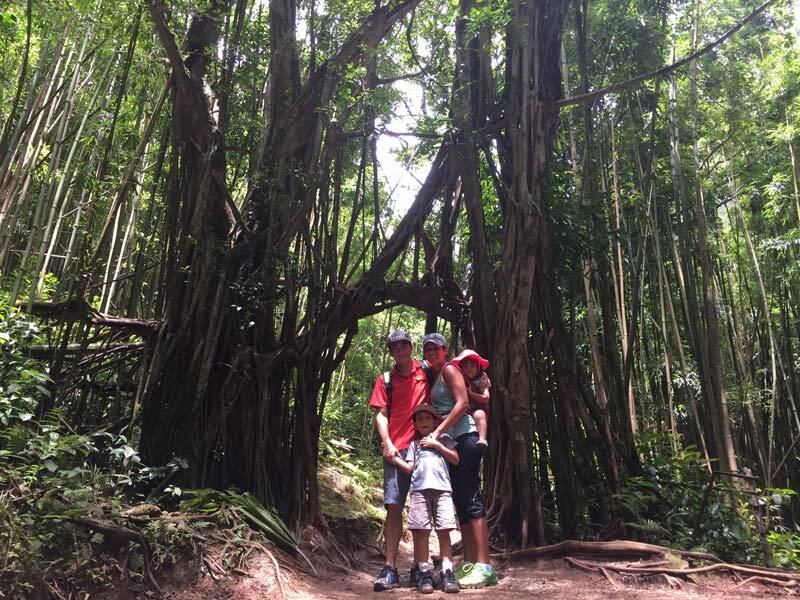 We had the opportunity to stay at the Four Seasons Hualalai and it was amazing! We had been so stressed out with homeschooling, the blog, my husband working a ridiculous amount of hours, that this is just what we needed. The ambience at the hotel was completely peaceful and relaxing, the hotel itself is beautiful, and the restaurants quite good. The only thing that was disappointing is that they did not have many vegan options. Sometimes it can be such a drag to have to request special meals all the time, it would be nice if there was at least a couple of vegan options on the menu. We also celebrated our 8 year anniversary there, and got a babysitter so we could go out to dinner. It’s amazing how a couple of hours away from the kids, and the stress can put things into perspective. Hopefully one day we can visit another one the Hawaiian islands. Instead of sweet potatoes you could use russet, yukon gold or any other type of potato. The chickpeas could be substituted with any other bean. Cauliflower would also be a great addition to this dish. Bring a small pot of water to a boil. Add chiles, tomato and bay leaf and turn heat down to a slow simmer. Let simmer for 10 minutes. While the chiles are simmering, heat a large pot to medium heat and add ¼ cup of water. Add onion and sweat until tender and translucent, about 4 minutes. Add potatoes and 1 cup of vegetable stock. Cover and let simmer for about 6 min or until potatoes are tender. 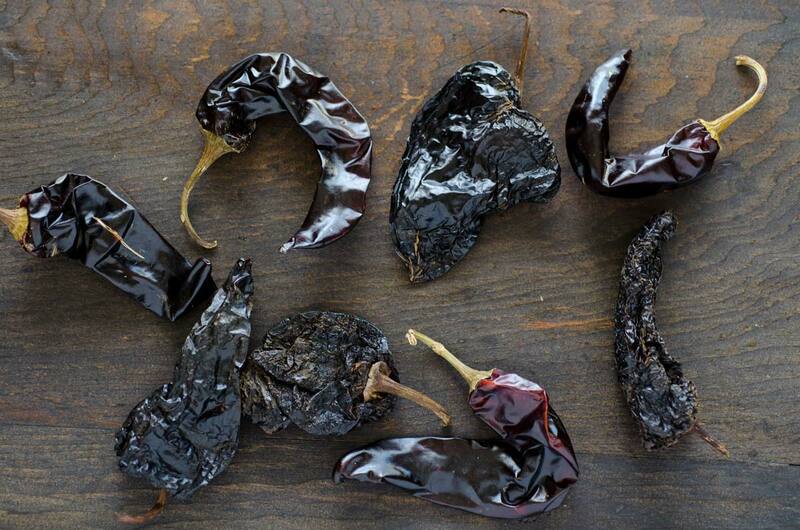 Strain the chiles, but reserve one cup of the chile soaking liquid. Place the drained chiles, garlic, tomato, oregano, cumin, and 1 cup of the chile soaking liquid in the blender and blend until smooth. Strain the sauce. Add sauce, chickpeas, and sprigs of thyme to the pot with the potatoes. Let simmer slowly for 8-10 minutes. 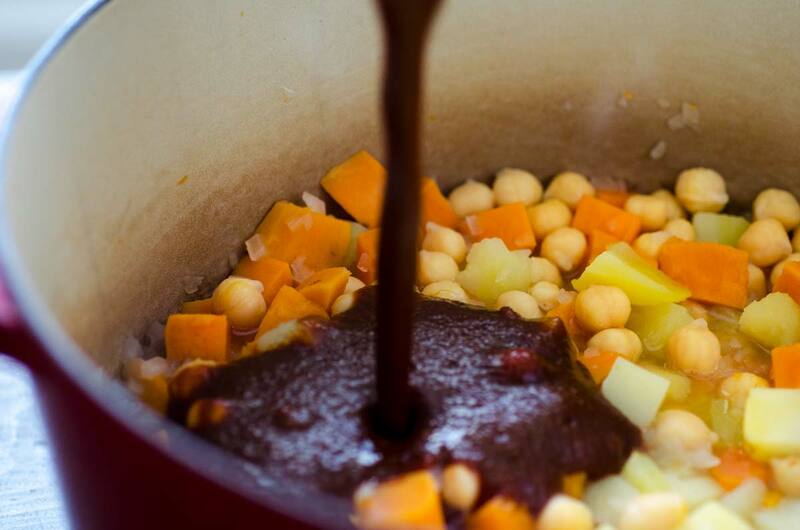 If the sauce is too thick, add more vegetable stock accordingly. Season with salt and pepper. Remove thyme sprigs before serving. Serve with rice, beans, and warm corn tortillas. 11/09/2016 /4 Comments/by Dora S.
During the summer I probably make these calabacitas tacos once or twice a week. (Every mom in Mexico makes calabacitas, it is one of the most common side dishes.) 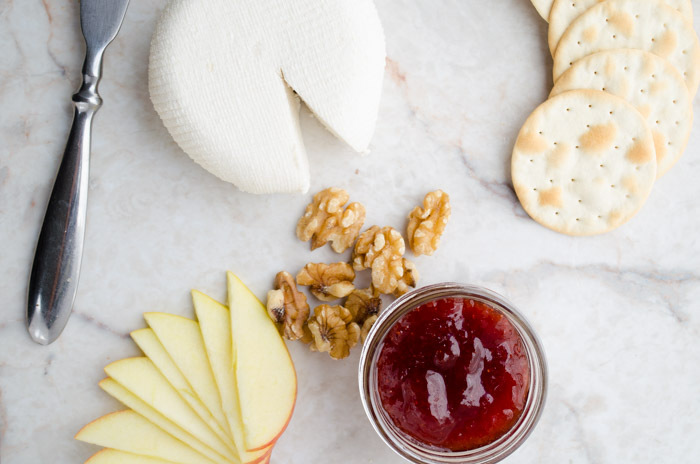 They are super easy to make and they utilize all the wonderful summer produce available at the local farmer’s market. 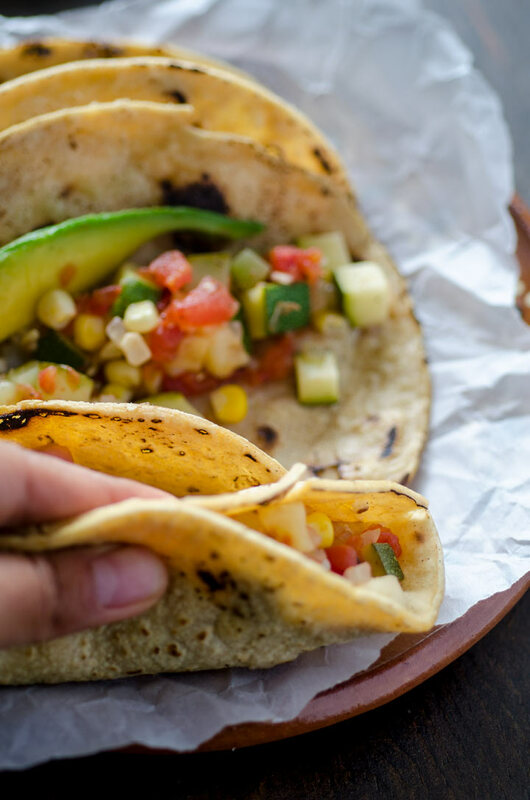 Tender zucchini, ripe tomatoes, sweet corn, and garlic stew together to make a satisfying, finger licking taco. 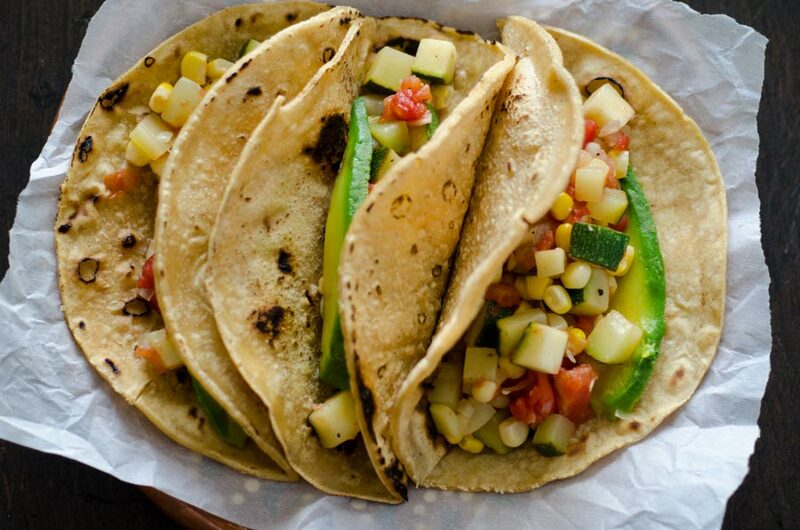 Traditionally calabacitas tacos are topped with crema and cheese. 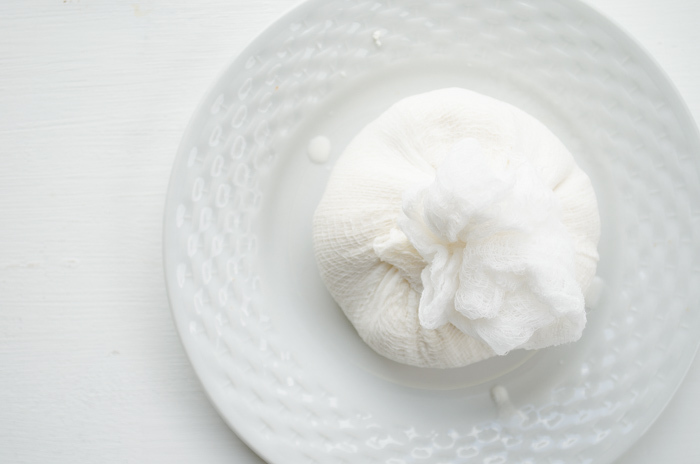 However, this time I have chosen to use avocado instead, but feel free to use my recipe for almond crema and macadamia nut cheese, or top with your favorite vegan cheese. 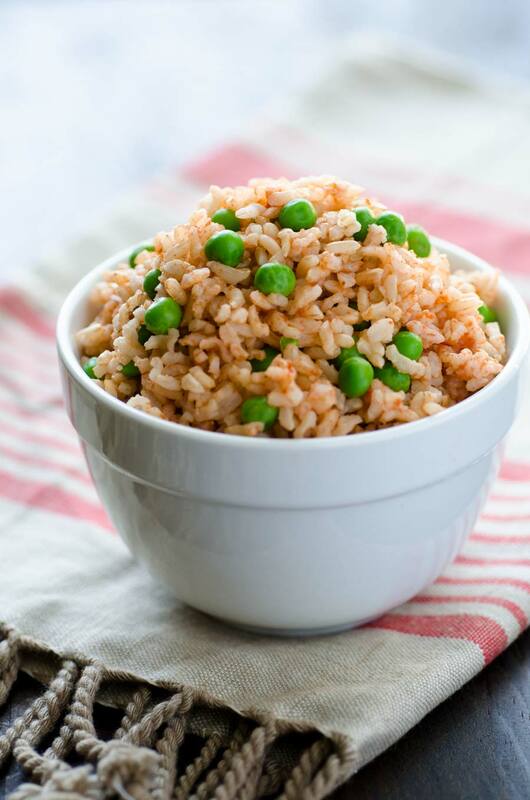 If you would like to make this a heartier meal you can add baked tofu or your favorite beans. 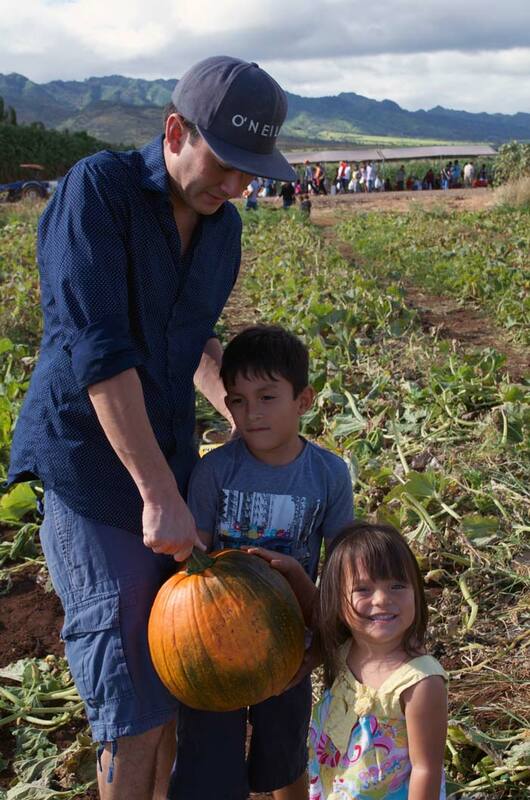 This week we went back to the Dole pineapple plantation to ride the train. The plantation has a little train that takes you on a tour of the plantation fields. The kids were more than happy to ride around on the train and spend time with their dad, and the view was amazingly beautiful. While at the plantation my husband and I were commenting that we were so ready for the summer to be over. There are so many tourists, everywhere, all the time. More than 8 million people visit Hawaii every year! It can get kind of crowded. I expect that around September or October things will slow down a bit, and we can enjoy some quiet time at the beach. Look at me sounding like a local! 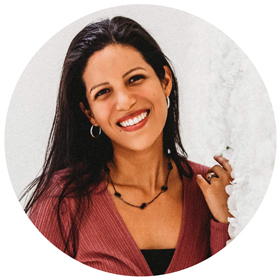 I am in the process of planning the recipes for the next couple of months, and I want to know what YOU would like to see on the blog. 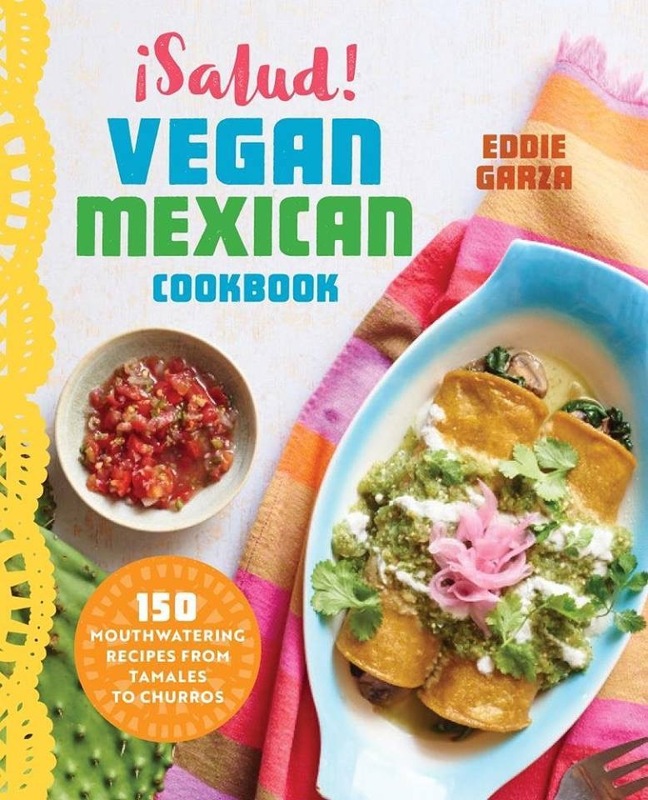 There are many wonderful Mexican recipes that still need to be veganized, so tell me about your favorite Mexican dish or food memory and I will try my best to make it vegan and healthy-ish. 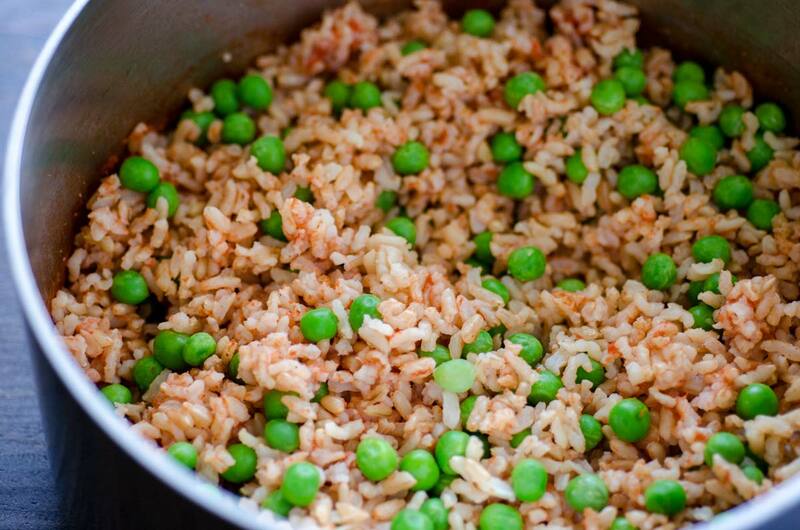 This has always been one of my favorite recipes and it is great in tacos, or served over rice with lentil picadillo. Enjoy! In a large heavy bottomed pot, set to medium heat; sweat the onion in 1/4 cup of vegetable broth for 2 to 3 minutes until onion is translucent. Add corn and garlic and pour in remaining ¼ cup of vegetable broth, cover and let steam until corn is tender, about 3 – 4 minutes. Uncover, add zucchini and cook for 3-4 minutes, until it begins to soften. Add tomato and cook for 5 minutes more, or until all the vegetables are tender. 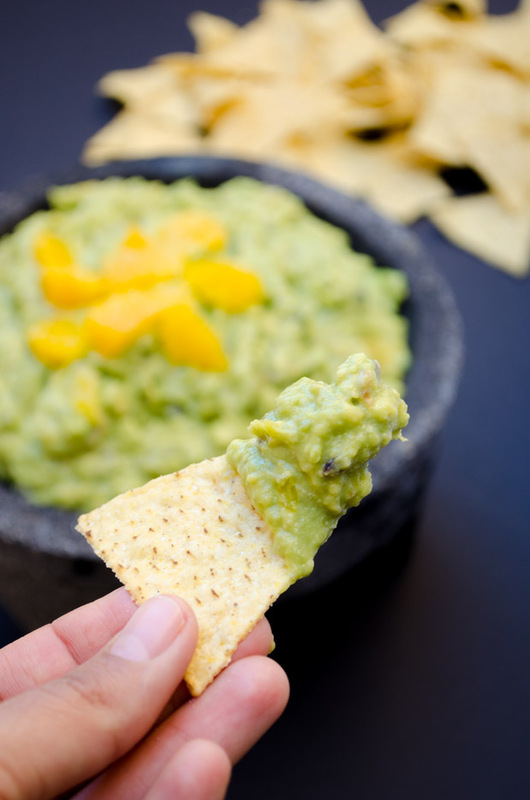 Season to taste, and serve on warm tortillas with avocado slices and salsa. During the summer I probably make these calabacitas tacos once or twice a week. (Every mom in Mexico makes calabacitas, it is one of the most common side dishes.) They are super easy to make and they utilize all the wonderful summer produce available at the local farmer's market. 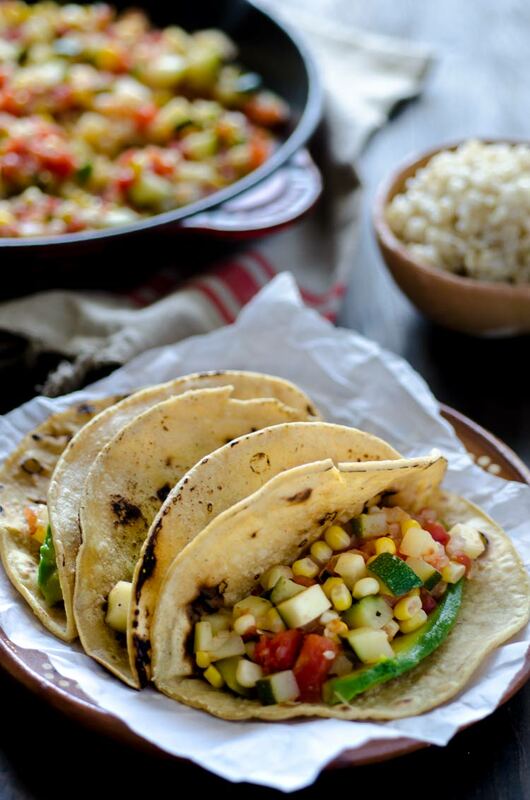 Tender zucchini, ripe tomatoes, sweet corn, and garlic stew together to make a satisfying, finger licking taco. 08/16/2016 /5 Comments/by Dora S.
Life is good right now, busy but fun. The kids are almost done with school and we’re looking forward to staying in our pj’s until well past 9am during the summer. The baby is probably going to be walking within a month, eek! We spent Mother’s day at a friend’s house celebrating her daughter’s first communion. Dylan gave me a beautiful cross he made at school and my hubby gifted me several outfits to update my wardrobe. I joke that he’s my stylist, but I really don’t have any fashion sense at all, so I need all the help I can get. 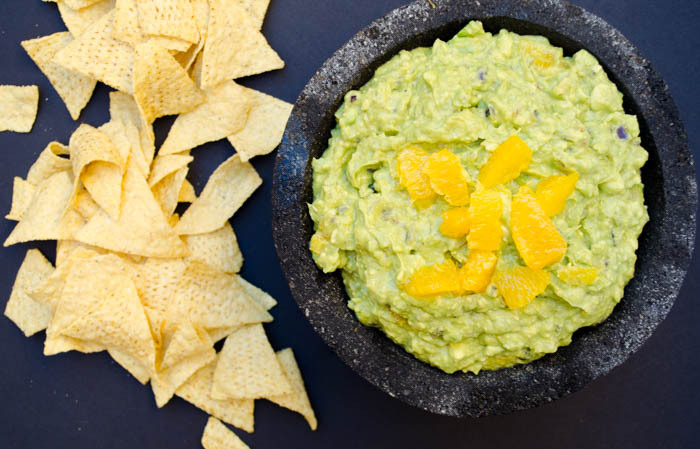 In reality, you can add pretty much anything to guacamole. This recipe is adapted from a Rick Bayless’s show, One Plate at a Time. The major difference is that he uses a grill to char the garlic, peppers, and onions and I use the broiler in my oven. 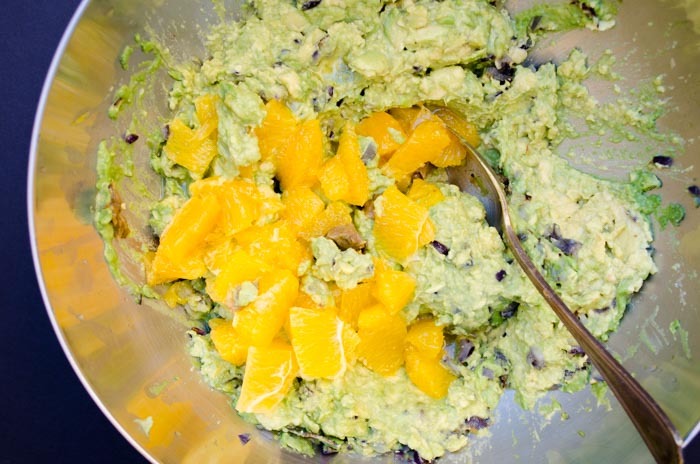 I really enjoyed this guacamole, the acidity of the oranges contrasts the creaminess of the avocado, the smoky flavor of the roasted garlic and chiles permeates throughout, and finally the hint if sweetness from the orange brings it all together. Enjoy! Set your oven broiler on high. 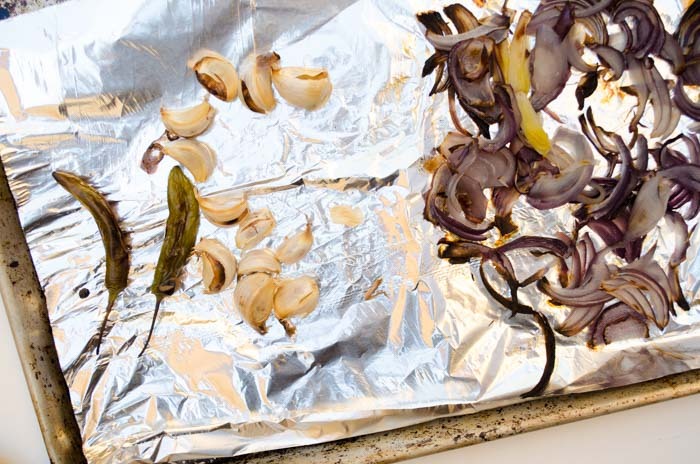 Line a sheet tray with foil or parchment paper and place the garlic, sliced onion, and Serrano peppers on it. Place under broiler for 7 min. Remove the garlic from the oven and set aside. Flip the peppers and toss the onion so it chars evenly. Return to oven for 5 -7 more minutes or until the peppers and onion are charred, but not burnt. Chop the onion and peppers and set aside. 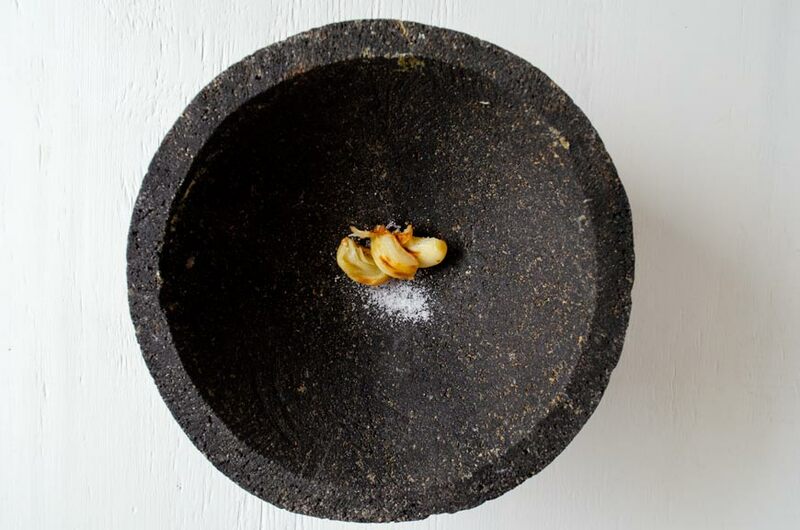 Peel garlic and place in a molcajete, mortar and pestle or you can use your knife to turn the garlic into a paste. 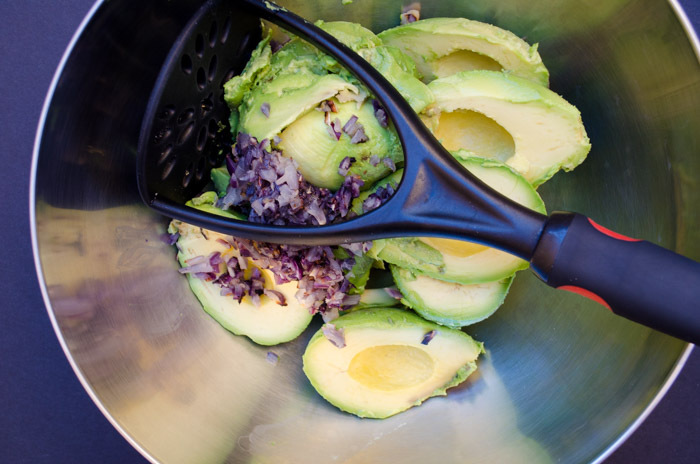 Place the garlic paste in a large bowl and add the chopped pepper and onion, avocado, and chopped cilantro. Mash with a potato masher to the desired consistency (I like mine chunky). Season with salt and pepper and lime juice to taste. 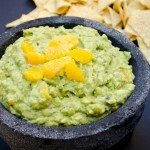 Cut the orange supremes in half and fold them into the guacamole. Serve with your favorite chips. To cut segments from oranges, cut both ends off the orange. 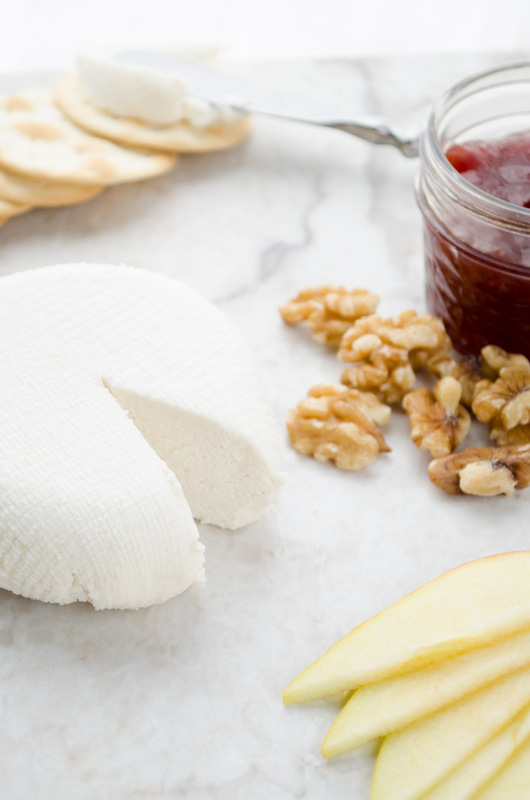 Stand it up and cut away the rind and white pith with a knife. Using a pairing knife, slide the blade between one of the segments and the membrane. Cut until you reach the center of the orange, repeat on the other side of the segment. 05/14/2015 /4 Comments/by Dora S.